Malini has Cerebral Palsy, a neurological condition similar to adult stroke, which makes body movement and speech extremely difficult. However, the cognitive functions of brain can often remain unimpaired, as in the case of Malini. She recounts her experiences from childhood to adulthood, her struggles with motor skills and speech, managing day-to-day activities, and the apathy and indifference of people towards her and others who are disabled. She educates herself, learns to type with her little finger and speak through the Lightwriter. Finally, she works through unfavourable social systems and attitudes to get a career as an event manager. Read more information about Malini. From all at SAGE, we send our congratulations on this very deserved award. 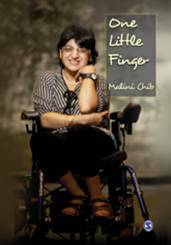 This entry was posted in SAGE Connection, SAGE news and tagged authors, Awards, Cerebral Palsy, disability, IDPWD, Malini Chib. Bookmark the permalink.